SPEAK ON YOUR PODCAST/ INTERVIEW! I am passionately dedicated to sharing the medicine of frame drumming with spirited women. If so, please consider interviewing me as a special guest! Ways to incorporate sacred drumming into your personal practice and professional work. If participants do not have a drum, they can play on a book, pot, or even on their bodies! I can get people drumming within 15 min! I will also offer everyone who attends the call a special gift – a FREE Frame Drum Mini Online Course! If you are interested, please schedule a time to talk to clarify the details and arrange your interview time. SHARE MY BLOG WITH YOUR COMMUNITY! WOMEN and THE ANCIENT FEMININE LINEAGE! You are welcome to share this freely with your community! *Of course, you are welcome to do BOTH… an interview AND blog with your community! The blog would be a wonderful way to promote the interview! BECOME A FRAME DRUM ACADEMY AFFILIATE INVITE! I have poured my heart and soul into an incredible online “academy” where students can learn how to play this beautiful instrument. It is called Frame Drum Academy. I have put together a generous AFFILIATE Program, where you earn 35% from each sale! 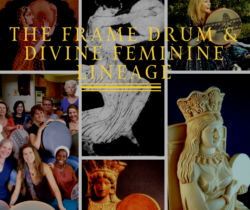 This is a wonderful opportunity to help spread the wisdom and lineage of this SACRED WOMEN DRUMMING TRADITION — as well as earn money! PS. ★ Please note these are time sensitive offers!